Choose Org Admin from the Settings menu after signing on, if needed. Click Manage Users to open the User Management screen. At the top of the screen, click Add a new user. Complete the user profile as follows. Items marked with* are required. Employee ID* - If your district uses a specific ID for reporting, such as a district or state ID, you may add it here to make reporting easier. Alternately, you may enter an email address as a placeholder. Subjects – Choose the user's subjects from the menu. Grades – Select the grade(s) the user works with. School Affiliations – If appropriate, choose the organization(s), district(s), or school(s) the user is associated with. Be aware that school affiliations restrict the user's activity to the selected organizations. 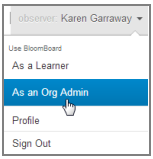 Roles* – Select the appropriate role(s) for the user. Users can have multiple roles. All roles have associated options that display when you select the role. The options are explained below. Learner Rubrics* – The learner role requires a rubric to display in the learner's rating and tagging activities. Click in the Select Rubric field and choose a rubric from the list. Learners should have only one rubric. Learner Learner Template Groups – If your organization uses Learner Template Groups, select the appropriate template group for the user. Please check with your system administrator or support if you are not sure whether to assign a template group. Template groups restrict the type of activities that can be assigned to the user, so use caution when assigning template groups so you don't inadvertently block a user from a needed activity template. Observer Observer Template Groups - If your organization uses Observer Template Groups, select the appropriate template group for the user. Please check with your system administrator if you are not sure whether to assign a template group. Template groups restrict the type of observation templates that can be used by the observer, so use caution when assigning template groups so you don't inadvertently block a user from a needed observation template. Active – Leave at Yes to activate the user. Helpful Hint: When you select a role, a link displays allowing you to make the role the default. Use this for multi-role users who want a specific role as their default.